Recently U.S. President Donald Trump has expressed his opposing views on upcoming Russian-German natural gas twin-pipeline project — Nord Stream 2 project (On May 19). In response to his views, the Russian President Vladimir Putin has taken a stand to provide necessary defense against any attempts by the United States to block the project which intend to supply extra natural gas to energy-starved Europe. 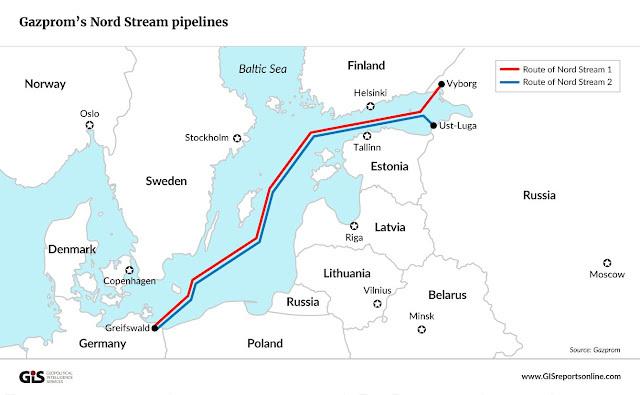 The twin-pipeline will run in parallel to current Nord Stream pipeline. The Americans are constantly opposing this project as it will increase Europe's dependency on Russia for gas supplies. It’s also worried the pipeline could open ways for Russia to install undersea surveillance equipment in the Baltic Sea, said Sandra Oudkirk, U.S. Deputy Assistant Secretary of State for Energy diplomacy while speaking to reporters in Berlin. Also, Oudkirk wanted to pass on the message to German officials that if the project goes ahead, European companies will be open to U.S. sanctions under a bill passed in August 2017. The move could affect Gazprom’s financial partners in the project who are mainly based out of Europe. The Polish official said Poland and the U.S. hold similar views on the project and have criticized it. In Germany, Chancellor Angela Merkel is scrapping coal and nuclear power, making gas increasingly the most important energy source which can help Germany along with the participating partner countries in achieving climate goals, as gas-fired power generation only emits half as much CO2 as coal-fired power generation. Approximately half of EU gas imports from Russia flow through Ukrainian territory and in talks with Putin, she made clear that Ukraine must be able to continue to earn revenue from gas transit. In recent years, Russia has reduced the volume there in favor of the Nord Stream 1 or the Opal pipeline in Central Europe. This change has hit Ukraine’s finances, with estimates suggesting that Ukraine will lose $2bn in transit fees each year. Despite Berlin and Moscow have been at loggerheads since Russia's annexation of Crimea four years ago, Berlin views the Nord Stream 2 twin-pipeline as well as a landmark 2015 nuclear deal with Iran as "islands of cooperation" with Moscow. Deutsche Welle, however, pointed out that the United States has self-interest due to underlying reason — "Washington would like to export to Europe the natural gas it extracts through hydraulic fracking, pushing Gazprom out of the market." 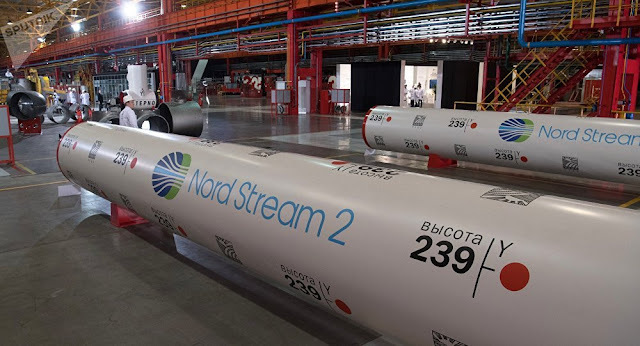 The new natural gas twin-pipeline is an initiative of Russia’s Gazprom PJSC (which has a legal monopoly over Russia’s pipeline gas exports) and five European companies established in the form of a consortium company (Nord Stream AG) in Switzerland in 2015. Gazprom itself is taking on half the planned costs of some 9.5 billion euros ($11 billion). The rest is divided among five European energy companies: BASF’s Wintershall and E.ON spinoff Uniper, Anglo-Dutch group Shell, Austria’s OMV, and Engie. The twin-pipeline will comprise about 200,000 individual pipe sections, each 12 meters long. If built, the 1,230-kilometre Nord Stream 2 pipeline, which is scheduled for completion in 2019, will supply around 55 billion cubic meters of natural gas a year from Russia to Germany under the Baltic Sea, circumventing Poland, the Baltic states, and Ukraine. Historically, Europe has always been dependent on Russia for its requirement for natural gas, much of it shipped via the Black Sea region. There are three main routes: the Ukrainian pipeline network (built during the Cold War), the Yamal-Europe pipeline (via Belarus and Poland, built in the 1990s) and the Nord Stream pipeline (inaugurated in 2011 and providing a direct link between Russia and Germany via the Baltic Sea). In addition, Finland and the Baltic countries have their own direct pipeline connections to Russia. And until the last decade, these deliveries were relatively stable and uneventful. 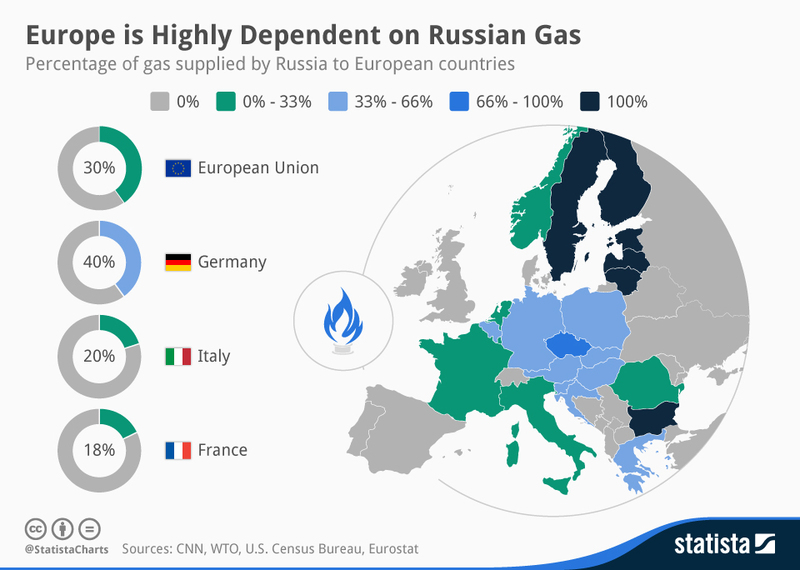 Even during the Cold War, the Soviet Union refrained from deriving any sort of political benefits from Western Europe’s dependence on its natural gas. Do note, European domestic gas production is declining. Capacity from other importers, namely Norway, is approaching its limits. And, at the same time, despite exploring the alternatives, Russian natural gas exports to the European Union hit a record 155 bcm in 2017. Nord Stream 2 is expected to be completed in the third-quarter (Q3) 2019. With reporting by BBC, Bloomberg, Deutsche Welle, Reuters, Statista, and World Oil.